Tartarus is a new black metal band from Dubai of United Arab Emirates, a country with a very limited number of metal bands. They were formed in 2013 by Ravenson and Nauman, both of Syrian origin and soon two more members completed their line-up. In ancient Greek mythology Tartarus (Τάρταρα) is a deity of the underworld, or a place of the underworld where souls were judged and the wicked ones were tormented, as well as the place where the legendary Titans were imprisoned. Tartous is also a Syrian city in the Mediterranean coast, where Ravenson and Nauman come from, something that made the choice of band-name quite easy! Tartarus signed recently to the Russian label Haarbn Productions, a label that likes to discover bands from various countries around the world and in the summer of 2014 they released their debut EP “Of Grimness and Atrocity“. The EP contains 5 songs, including an Emperor cover and its total duration is almost 26 minutes. The album begins with a short intro, preparing you for something much more raw and extreme than what the band offers in the main album. Surprisingly enough for a debut EP, they have a very good sound for the standards of underground black metal, probably thanks to the band members’ previous experience in other projects. Tartarus have found a great balance between aggression and melody, using only the basic metal instruments, without any synths at all. The band has done a really great work in rhythm and bass guitars and especially in lead guitars that carry the main “load” of the compositions. They have a raw yet technical sound, perfect for the genre, with an “evil” atmosphere. There are parts where they have influences from local traditional tunes and scales, but they keep them quite discreet in their melodic lines. Their cover on Emperor’s “I am the Black Wizards” respects the original song, but at the same time it’s brought closer to Tartrarus sound. Their vocals are typical black metal screams, of a little more extreme nature than the music itself, perfect for their dark atmosphere. All their lyrics are in English, dealing with dark epic fantasy themes. 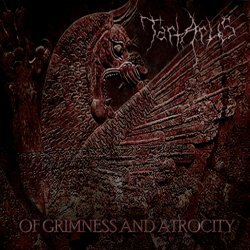 I admit that “Of Grimness and Atrocity” exceeded my expectations and each time I listened to it, I liked it even more. If you are into underground black metal, then Tartarus is a nice recommendation. Their raw, yet solid, technical and melodic sound leaves many promises for the future and I hope to see them in something more complete. The EP is released via Haarbn Productions in a jewel-case CD edition limited to 100 numbered copies. It comes with an 8-page booklet, including all the lyrics; artwork is by Amonet. You can visit the band’s official pages below for more details and to listen to their music.